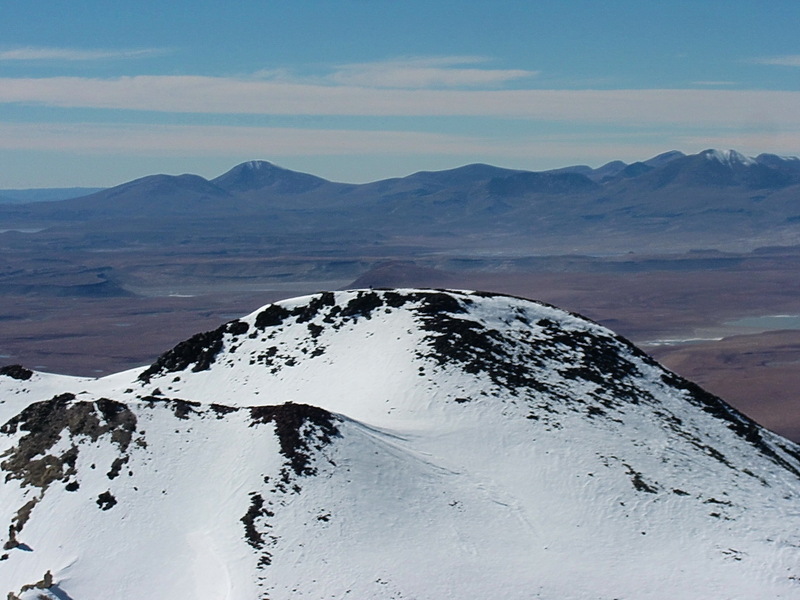 The mountain Volcan Uturuncu is with 6008 meters sea level the tallest mountain in the south part of Bolivia. It is an active volcano with two peaks. The last eruptions were in April 2003, after being hundreds of years inactive. There were some mining activities on this mountain and a rough dirty roads leads into the saddle between the two peaks. This road can be used by good 4-wheel cars up to 5400 meters, depending on the snow conditions. 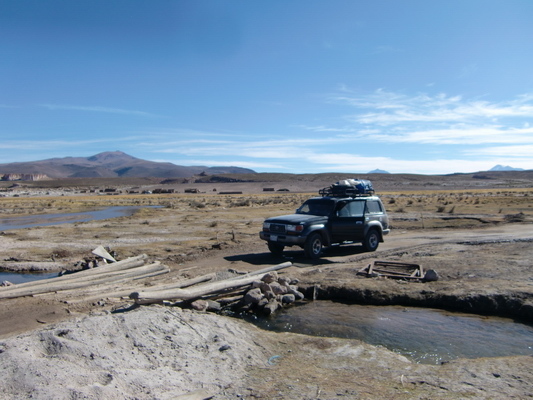 Uturuncu lies in a very remote area: The access from Uyuni is one long day by dirty roads, only possible with a 4-wheel car. 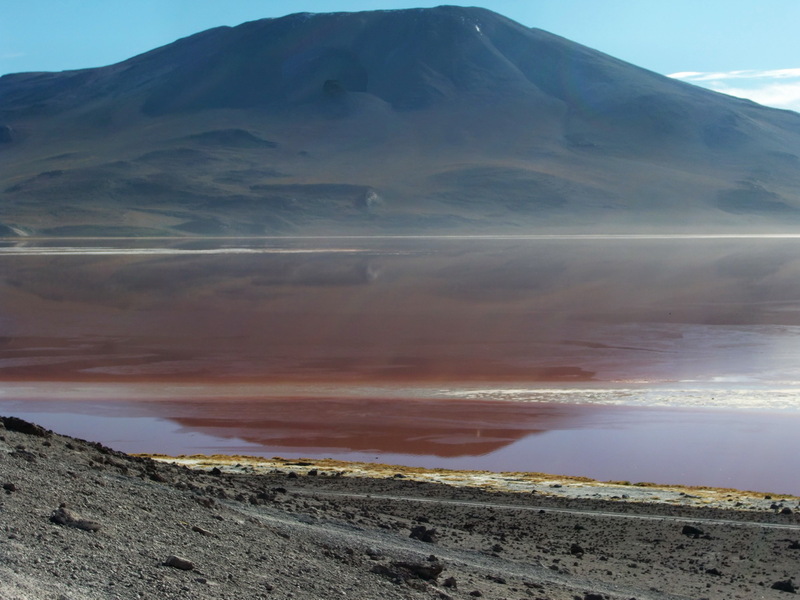 The 60 square kilometer big Laguna Colorada (red lake) is 4h drive West of Uturuncu in an altitude of 4275 meters. It is an unique natural spectacle, because the water color seems to be red, green and white depending on the sunset. This is caused by plankton. 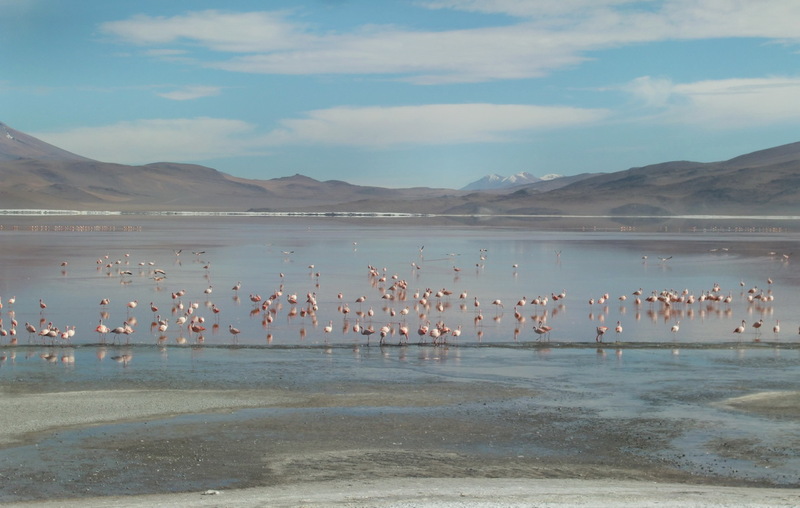 The plankton attracts a lot of birds like flamingos. 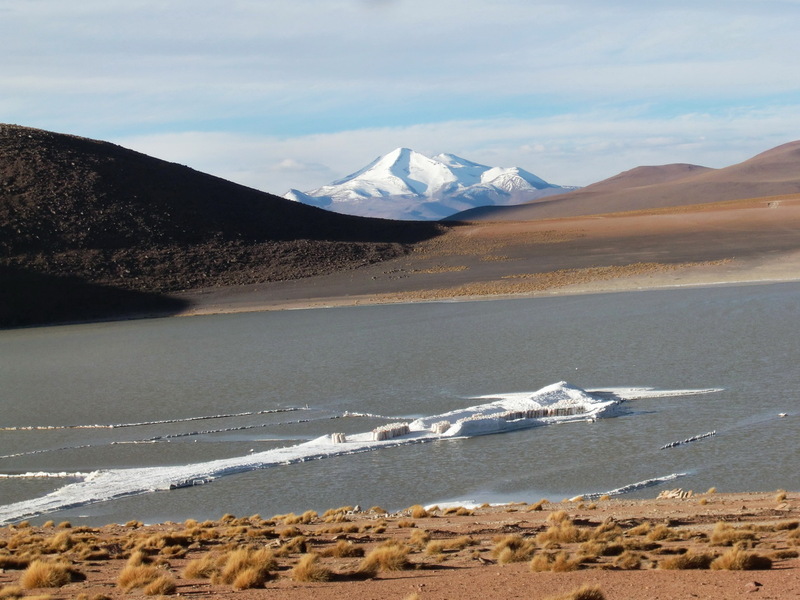 This is the second part of our trip with Fronia and Obet, see also our report Volcano Tunupa and Salar de Uyuni. In this article a map is included. 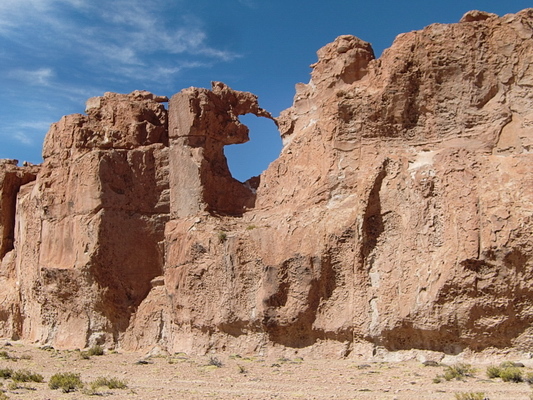 After a cold and uncomfortable night in a hostel in Uyuni we started with Fronia and Obet the long way to the village Quetena Chico, which is the base for the ascent to Uturuncu. 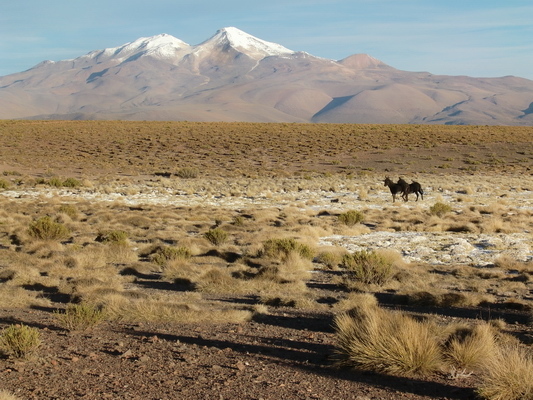 We had marvelous views to the mountains in the Southwest corner of Bolivia, especially to the two peaks of the Volcano Uturuncu. We stayed in a much better hostel in Quetena Chico than in Uyuni. 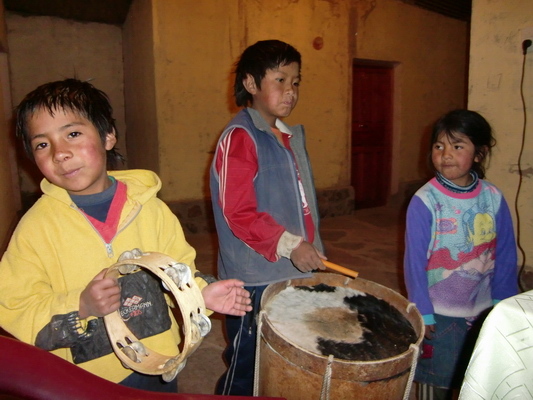 After the delicious dinner we enjoyed some music from the kids of Quetena Chico. We started very early in the next morning on May 30th 2011, at 4:00AM. Obet drove us three hours close to the saddle between the two summits of the Volcano Uturuncu. Uturuncu is supposed to be one of the simplest 6000er of our world, just few hours walking according to some mountain books. This was not the case for us, because the ascent from the saddle to the main peak was very tough and even dangerous due to frozen and hard snow and some icy parts. Fortunately we had our crampons, but we missed the ice-picks. And it was very steep, stumbling was definitely not allowed. Now we understood the Quetchua meaning of Uturuncu: Sleeping Tiger. 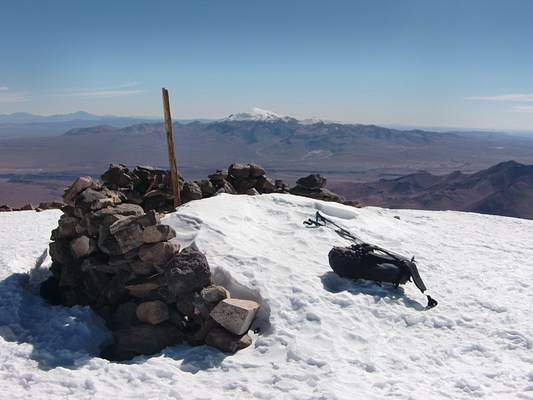 Marion decided to return before the steepest part and to go to the less steep east summit. The way to the saddle was easy, but surprisingly we heard water roaring. It was very cold, so it could not be melted snow. 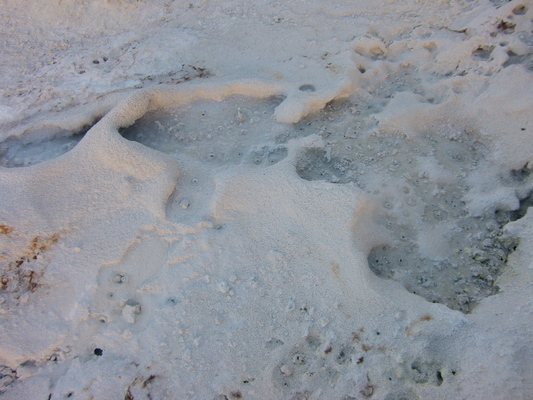 Suddenly we saw bubbles on the ground - Uturuncu is still very active and has some hot springs at 5700 meters sea level. But it was not enough hot water to take a bath. Marion arrived at the east summit (5930 meters high) at 11:00AM, the same time Alfred achieved the main peak (6008 meters high, GPS coordinates: S22° 15.857' W67° 11.221'). The views were overwhelming: Hundreds of lakes and other mountains. No civilization was visible. The descent from the main summit to the saddle was very annoying - like walking on raw eggs without crushing them. The snow and ice were still very hard. Obet was waiting for us in the Toyota Landcruiser, packed in a warm sleeping bag. 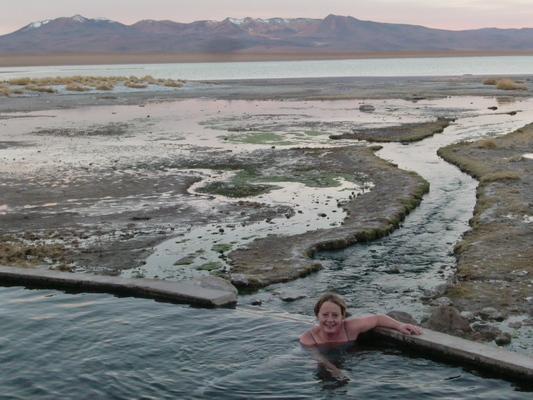 After the wonderful lunch in Quetena Chico we continued to the Termas de Chalviri. 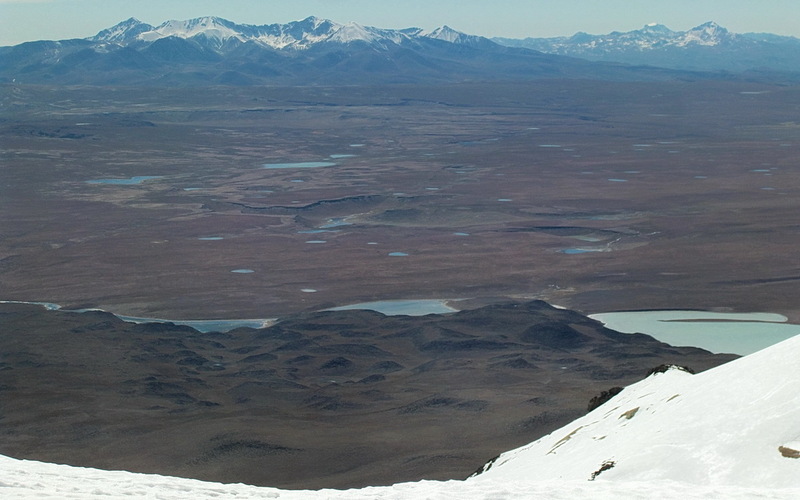 We had to cross the Salar de Chalviri and had stunning views to the Volcano Uturuncu. At sunset we arrived at the Termas de Chalviri. It was already very cold and we were reluctant to undress. But laying in the warm water (approximately 35°C) was wonderful, the highlight of the day. We spent the night in a hostel closed to the Laguna Colorada. The best was an open wood oven in the dining room. 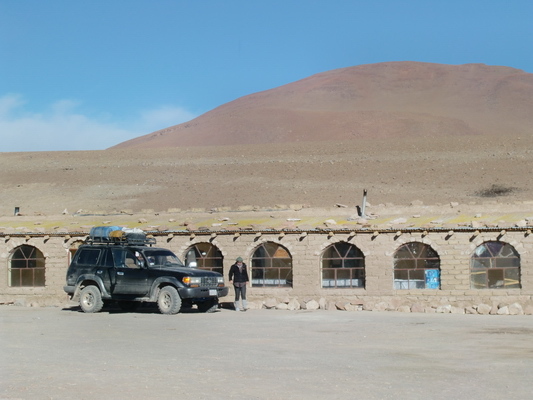 This hostel is more than 4200 meters high; consequently the evenings and nights are very cold. 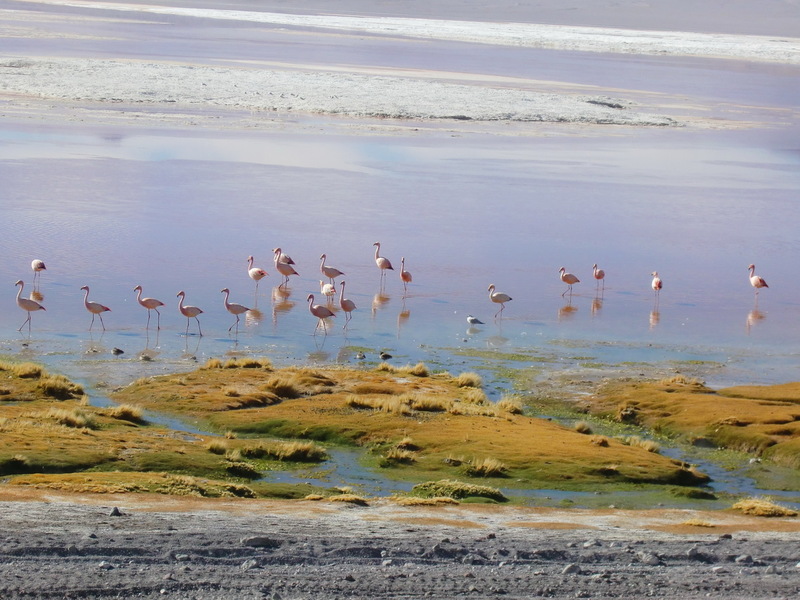 The Laguna Colorada is outstanding with its different colors and hundreds of flamingos. 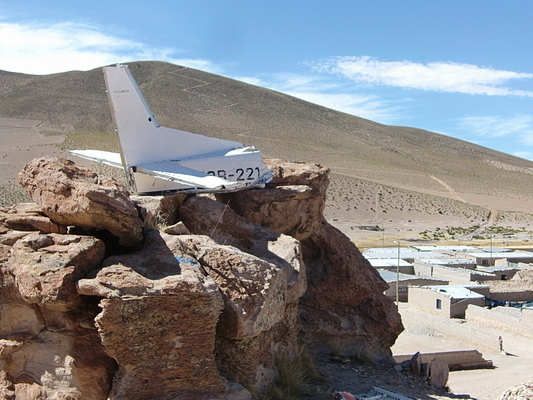 On the way back to Uyuni, we saw a strange parking lot for an aircraft in the village of San Cristobal. Finally we had our last lunch from Fronia at some splendid rocks. We arrived after sunset in Uyuni and everybody was a little bit tired. We would like to thank Fronia and Obet very much for this excellent and outstanding trip. Beautiful!! Like I, my self, was doing the trip.